All my life I have learned by crazes. A craze is a sudden and inexplicable fixation on some subject, some topic of research, some historic event or some other area of enquiry. A ‘proper’ craze should have no immediate practical application to one’s life. It’s just a craze, pointless in one’s current circumstances. In my childhood my favourite book was, ‘The Boys’ Book of the Navy’. It was about the Royal Navy and I thumbed through it endlessly. There were chapters on submarines, destroyers, cruisers, aircraft carriers, the Fleet Air Arm. 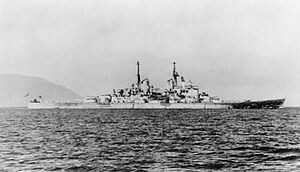 But the parts I read most often were anything to do with the last British battleship ever built – HMS Vanguard. I loved that ship. A next-door neighbour had served in the Royal Navy and told me stories of an adventurous life at sea. He said that, in England, boys could join the Navy at the age of twelve and that’s what I wanted to do. England was a long way from Australia so I begged my parents. They refused. Looking back on it, I think our neighbour must have been severely chastised for I did not ever again hear him talking about life in the Navy. In 1961, the British government announced that the day of the battleship was over. Vanguard would be decommissioned and sold for scrap. Shocked and disappointed, my craze on Vanguard came to an end. But I had learnt a tremendous amount about design constraints. More firepower, more armoured protection and more speed all compete with and constrain each other. … and worse, one technology can be superseded by another. The study of rivers became a craze. To my parents’ annoyance I dug up an enormous portion of the back yard and modelled a river system. There was a mountain at one end and an ‘ocean’ at the other. I trickled the garden hose in at the top of the mountain and watched all the features of a river develop right through to the delta as the water entered the muddy pond which was the ‘sea’. I rebuilt the system several times and ran the experiment over and over. From time to time, my mother came down from the back steps under the grape vine trellis and walked over to the ‘river’. She spoke with an accent more English than Australian – after all, she was English by birth. It was not a broad accent, nor affected, just a well rounded, well-to-do English way of speaking. She stood by the earthworks with a disapproving aura, not angry, not ranting, just mildly frustrated at the endless rearrangement of the backyard. She took a deep breath and, in a voice tinged with a degree of resignation, said, ‘I wish you wouldn’t do these things.’ There was no anger in it. No threat of punishment. She just wished I wouldn’t build rivers. After making this statement, and pausing a few moments, she walked back to the house, knowing that nothing could be done. I had a liberal childhood. Flight was another craze. I wanted to build an aeroplane out of aluminium strips and offcuts I had acquired from an aluminium window factory. I got nowhere. Underwater breathing equipment was next. I soldered the inlet valve from a bicycle tube into a hole I had punctured in a screw-top gallon tin. I attempted to pump it up with a bicycle pump. My plan for breathing underwater was to manually operate a little brass tap. I would open it momentarily to let the pressured air into my mouth. Totally unworkable. I had a craze on goldmining. Sure enough, I dug a shaft in the backyard. It was complete with a little wooden ladder down which I could climb the metre or so to the bottom. At the top was a tripod made from metal water pipes. A pulley, bucket and rope were attached, just like the diggings I had seen at Coolgardie. No gold, but field of gold for my imagination. One day Mother came down to the mine and looked exasperated, just as she had done with the river. ‘What are you doing now?’ she asked. For some reason she seemed to accept my explanation, ‘Just digging a gold mine.’ After gazing at the workings for a while, she walked back to the house wondering how long this craze would last. One year in Perth there had been a very hot summer with severe water restrictions. The answer to my family’s need for water, I reasoned, was self-sufficiency. Water collection became my next craze. In the few light showers in early winter, I caught the water from the downpipe at the front porch. Milk bottles, buckets, empty jam jars, jugs, flower vases, and pots and pans of every description from the kitchen were pressed into service as water containers. These were stacked on every available bit of spare shelf space. Hardly a saucepan could be found with which to boil an egg. Perhaps Mother’s most endearing quality was her positive response to every situation. She announced that my collected water was marvellous for washing her hair. At last! I had found a practical application for one of my crazes. From then on, every time Mother needed a utensil to help prepare dinner, she had to wash her hair first! I embellish, of course. I had a craze on mortars. I actually made a rudimentary mortar and fired it from time to time on the hockey field across the road. I made the ‘bombs’ from melted car battery lead and formed them in sand moulds in my backyard factory. The barrel was two-inch water pipe. The propellant was a four-penny cracker. Upon firing, the bombs thudded heavily into the grass around thirty or forty metres away. What a contraption. My interest in mortars developed into a general interest in armaments. With two boys from down the street, I dismantled a bicycle pump so that the cylinder of the pump became a barrel. With intricate care we dangled a needle and thread down through the screw hole at the top and connected it to the wick of a one-penny cracker. Carefully, we dragged the cracker back along the cylinder so that the wick protruded from the screw hole and the cracker now sat in the ‘chamber’ of the barrel. With a wooden rod, we rammed down a small wad of newspaper to compress the cracker into place. Then a crude lead bullet was dropped in. To make the bullet, we used the same technique of molten lead and sand moulds that I used in the mortar bomb factory. Then another wad of paper was rammed in, just like Red Coats with their muskets at Waterloo. The barrel was placed in a cradle of sorts, aimed at a sheet of heavy-duty galvanised iron and loaded down with some bricks to prevent recoil. Two boys hid behind the thick trunk of the Jacaranda tree. The third lit the wick and rushed to hide behind the others – a little conga line of crouching boys behind the tree. A short wait and, ‘Bang-Slap’. We moved forward to see the great tear mark ripped through the iron as the bullet had slapped through it. Success! We fired our gun at other things; fence palings, flower pots, the back wall of the shed and other targets. With all these targets shattered, we wondered about the range of our cannon. Ah! The ideal proving ground would be the Swan River near our home at Claremont. We would fire from the river bank and observe the splash. This would tell us the range. It happened to be Saturday afternoon when we arrived at the beach for the test firing. Yacht races from two different yacht clubs criss-crossed the waters of the wide estuary. Row boats and launches also crowded the bay. We waited patiently for a gap in the arc of fire ….. and fired! None of us saw the splash so we simply concluded that the bullet had gone a long way. Dangerous stuff. I suppose all this interest in projectiles and trajectories helped me when I went to the Royal Military College, Duntroon. In the final exam of the artillery syllabus I achieved a mark of 76 per cent – the highest mark I ever got for anything and the crowning glory of my academic life. My father, a ship’s officer in the Merchant Marine, was away for long periods and so was not present to intervene with my more excessive crazes. And, in any case, when he was home on leave, I idolised him so much that I would just follow him around as he painted the house, nailed things or pottered in the shed. Better still, I sometimes accompanied him to Fremantle Harbour for a short session of duty when he was called back from leave to move a ship a short distance from one berth to another. High adventure. When Dad was home, crazes were suspended for the time being. At the age of 15, I began my longest craze. It was the Abrolhos Islands and the Dutch shipwreck off the coast of Western Australia in 1629. I sustained this craze, albeit in a mild form, for 50 years until I visited the islands when I was 65. I saw the exact position of the wreck of the Batavia. I learnt a tremendous amount from each of my crazes. « Omega 3 benefits direct to food consumers	» Do cattle increase carbon levels in the atmosphere?